Compute the depth of the description. Default is 0. Returns a compound signature that identifies the canonized description. It builds a fingerrint so that [[Foo::123]][[Bar::abc]] returns the same signature as for [[Bar::abc]][[Foo::123]]. An extension to a description should not rely on the query string as sole representation for a fingerprint. Identifies an arbitrary membership to a wider circle of descriptions that mostly occurs in connection with a Conjunction, Disjunction, or SomeProperty. Get the (possibly empty) array of all print requests that exist for the entities that fit this description. Report on query features used in description. 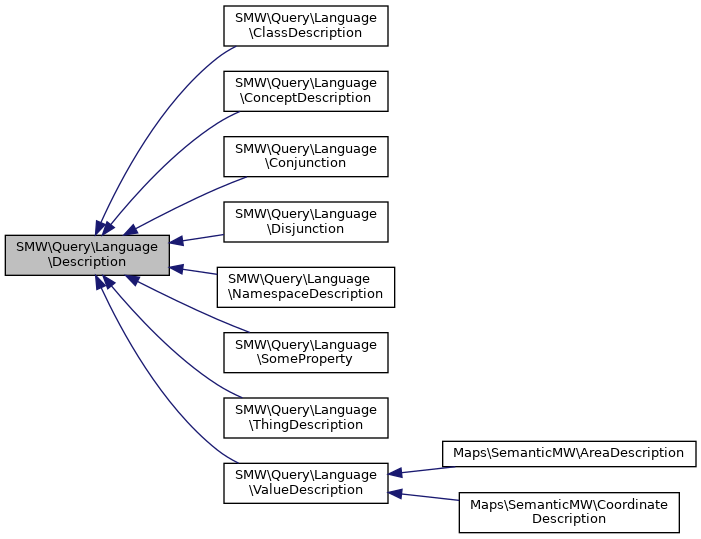 Return values are (sums of) query feature constants such as SMW_PROPERTY_QUERY. Return a string expressing this query. Some descriptions have different syntax in property value positions. The parameter $asvalue specifies whether the serialisation should take that into account. Example: The SMWValueDescription [[Paris]] returns the single result "Paris" but can also be used as value in [[has location::Paris]] which is preferred over the canonical [[has location::<q>[[Paris]]</q>]]. The result should be a plain query string that SMW is able to parse, without any kind of HTML escape sequences. Compute the size of the description. Default is 1. Return true if the description is required to encompass at most a single result, independently of the knowledge base. Add a new print request, but at the beginning of the list of requests (thus it will be printed first). Recursively restrict query to a maximal size and depth as given. Returns a possibly changed description that should be used as a replacement. Reduce values of parameters to account for the returned descriptions size. Default implementation for non-nested descriptions of size 1. The parameter $log contains a list of all pruned conditions, updated when some description was reduced. Objects must not do changes on $this during pruning, since $this can be reused in multiple places of one or many queries. Make new objects to reflect changes! Set the array of print requests completely.